Limerick Civic Trust has said it respects the decision of controversial columnist Kevin Myers in choosing to withdraw his attendance from a talk in Limerick next month. The trust faced a storm of “vitriolic” abuse in recent weeks after it announced that Mr Myers was to moderate a talk on censorship in Limerick city. David O’Brien, chief executive of the trust, told the Limerick Leader that he has spoken at length to Mr Myers in recent days, who felt it was best he withdraw from the forum “in the present circumstances”. “He felt that his presence was going to take away from the event itself and become an alternative event, and that just wouldn’t be right,” said Mr O’Brien. “Limerick Civic Trust respects the decision of Kevin Myers. A long-standing journalist in Ireland, Kevin has been no stranger to controversy and initiated many strenuous debates over the years. The trust does not comment on his comments. “However, the purpose of the autumn lecture series is to educate, inspire and inform public discourse. The series has been designed to challenge ideas and opinions, tease out arguments and hold a constructive debate and for that reason some of our commentators may be more controversial than others,” he said. The Sunday Times published an apology following the publication of an article on July 30 last by Mr Myers, which contained offensive remarks about women and Jewish people, suggesting that presenters Vanessa Feltz and Claudia Winkleman were well paid by the BBC because they were Jewish. The talk on censorship, which will be given by Jodie Ginsberg, of the Index on Censorship – the only female speaker in the series of talks organised by Limerick Civic Trust. The talk will now be moderated by Church of Ireland Reverend Patrick Comerford, of Rathkeale and Kilnaughtin. Ms Ginsberg earlier said she was “happy” for Mr Myers to moderate the event, while the trust also refused to withdraw the invitation after receiving a barrage of criticism. “I wouldn’t be much of a free speech advocate if I refused to debate with someone whose views I disagree with,” said Ms Ginsberg. “I am a feminist of Jewish heritage: I find much of what Myers has written deeply offensive,” she said. Mr Myers was invited by the trust to moderate the event about five weeks before the column which led to his dismissal from the Sunday Times, appeared in print. Mr O’Brien said the time-line of events is indicative that the invitation was not a “provocative, calculated” move on their part to attract a greater audience, which critics suggested. The trust received a number of “distasteful emails, full of vitriol” regarding Mr Myers’ name on the billing, as well as abuse on social media, in addition to criticism of its “male dominated” line-up of speakers. Mr O’Brien said they “weren’t seeking to have a male-dominated panel”, and admitted while “there is a gender imbalance, but it wasn’t contrived”. “In fact, we invited a lot of women, who weren’t available but have indicated their willingness to take part next year. So, in fact, next year it is quite possible that we will have a female-dominated panel,” he told the Limerick Leader. ● Jodie Ginberg’s lecture, ‘How censorship stifles debate and undermines the tenets of free and democratic societies’, is in Saint Mary’s Cathedral, Limerick, on 28 September 2017. Today is the feast of Saint Titus, the patron saint and first bishop of Crete. His feast is celebrated today [25 August] throughout the Orthodox Church. However, he was only added to the Calendar of the Western Church as late as 1854, when he was assigned to 6 February. In 1969, the Roman Catholic Church moved his feast to 26 January so he could be linked with Saint Timothy and celebrated on the day after the feast of the Conversion of Saint Paul. Saint Timothy and Saint Titus are named on 26 January in the calendars of many Anglican churches, including Common Worship in the Church of England, and the Episcopal Church, but not in the calendar of the Church of Ireland. But 25 August remains the feast of Saint Titus in the Orthodox Church, and his head is the important relic in the Church of Saint Titus in Iraklion in Crete. Saint Titus (Αγιος Τίτος) was a companion and disciple of the Apostle Paul and an early missionary. He is referred to in several of the Pauline epistles, including the Epistle to Titus, and brought a letter from Saint Paul to Corinth to collect for the poor in Jerusalem. He is believed to have been be a Greek from Antioch. Tradition says he was the first Bishop of Crete and appointed priests in every city in Crete. The first church dedicated to Saint Titus was in the old capital Gortyn, until its destruction by earthquake and the Arab transfer of the capital of Crete from Gortyn to Chandax (Iraklion) in the year 828. In 961, Nicephorus Phocas drove the Arabs from Crete, bringing the island back under Byzantine rule. 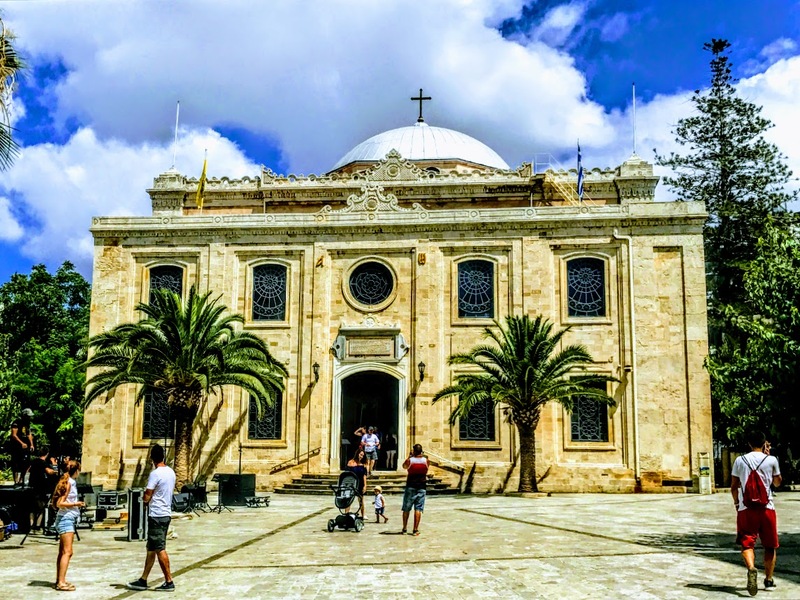 The first Church of Saint Titus in Iraklion may have been built then, and the skull of Saint Titus, the miraculous icon of the Virgin Mesopanditissa and other sacred relics from Gortyn were moved to the new church. When Iraklion was captured by the Turks in 1669, the Venetians removed all the relics from the church and took them to Venice. Under Turkish rule, the Church of Saint Titus was taken over by Vizier Fazil Ahmet Kiopruli, who converted it into a mosque known as the Vezir Mosque. A major earthquake devastated the city in 1856 and totally destroyed the mosque or former church. It was rebuilt as an Ottoman mosque in 1872 by the architect Athanasios Moussis, who also designed the Orthodox Cathedral of Saint Minas. The minaret of Saint Titus was demolished in the 1920s, when the last Muslims left Iraklion with the ‘exchange of populations’ between Greece and Turkey under the terms of the Treaty of Laussane. The Church of Saint Titus is one of the most important buildings in the centre of Iraklion. It stands on one side of Aghios Titos Square, a pretty plaza close to small cafés and bars and that faces onto 25 August Street (Οδός 25ης Αυγούστου). The street is the elegant, main shopping street in Iraklion, connecting the port of Iraklion with Lion Square. It takes its name from this day, the feast of Saint Titus, because of events almost 120 years ago on 25 August 1898 in the conflicts leading to the end of Ottoman rule in Crete and the incorporation of the island into the modern Greek state. This street, 25 August Street, runs from the Lion Fountain or Morosini Fountain at Platía Venizélou (Venizelos Square, also known as Lion Square), the central crossroads of the city, down to the Venetian harbour and the fortress of Koules. The street may have been first laid out by the Arabs in the ninth or tenth century. Ever since, it has been the main street in Iraklion, linking the city centre with the harbour. During the Venetian period, from the 13th to the 17th century, it was called the Ruga Maistra (Main Street). Here stood the palatial mansion of the Venetian Dukes or Governors of the island, and the Venetian buildings still lining the street include the Basilica of Saint Mark and the Loggia, all close to the Church of Saint Titus. In Ottoman times, the street was known as Vezir Tsarsi (Βεζίρ Τσαρσί, Vizier’s Market) after the Vezir Mosque. The street’s modern name is taken from a clash during the Cretan struggle for independence on 25 August 1898. On 25 August, a Christian official who had been appointed to manage the customs office in Heraklion was being escorted by British troops along the street from the harbour when they were attacked by a mob of Turkish fanatics. The Turkish mob went on a rampage through Iraklion. On this day in 1898, about 500 Christians and 17 British soldiers were killed, along with the British Honorary Consul, Lysimachos Kalokairinos, and houses and shops lining the street were set ablaze. In the reprisals that followed, 17 Turkish Cretans suspected as being the ringleaders were hanged, and many more were jailed. The British navy sailed into the harbour and the city was cleared of Turkish troops. Crete became a self-governing island, with its autonomy guaranteed by the European powers. Within 15 years, the Great Powers were forced to accept the Cretan demand for the union of Crete with Greece, which was finalised in 1913. In the early 20th century, after Crete had been incorporated into the modern Greek state, 25 August Street became the most fashionable street in Iraklion. New buildings on the street provided offices for the new Greek authorities and state bodies, transforming Iraklion into a modern city and enhancing the majestic vista from the port into the heart of the city. However, that first impression given to visitors belied the reality of life in the side streets and alleyways off the street, and many local people named it the ‘Street of Illusion’ (Οδός Πλάνης). Today, 25 August is a paved pedestrian street, lined with the most beautiful neoclassical buildings in Iraklion. Many of the neoclassical and Venetian buildings now house banks, travel agencies, tourist shops and cafés. But the Loggia has been restored and San Marco, which also became a mosque in the Ottoman era, is now an exhibition area. Walking down the street towards the harbour on a summer day, you can feel the cool sea breeze blowing up from the harbour and the Mediterranean. The parallel side streets and squares off 25 August Street have enticing ouzeri and tavernas. And today the street will be packed with people at procession and festivities celebrating the feast of Saint Titus.